Hi everyone. Its time for a new challenge at AAA Cards! This time we are looking for your cards with autumn colors. Anyway, I was really happy to see this challenge. My first thought was to do autumn leaves but when I was looking through my stamps, I decided to use these squares from Concord and 9th to bring the colors in. 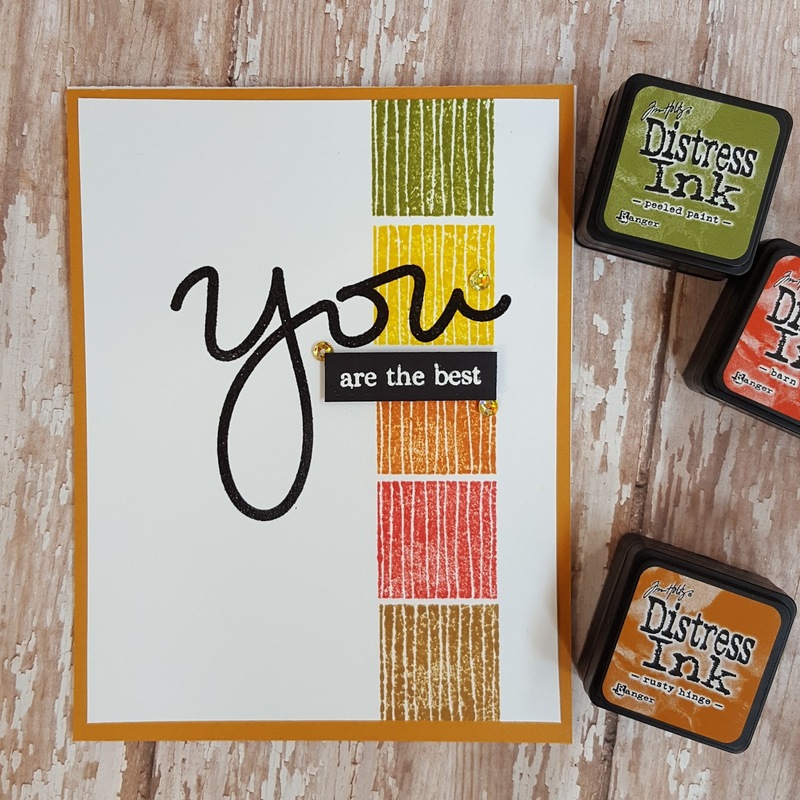 To start, I went through my stash and found several distress inks that I liked. Then I got my misti out and placed my stamp about halfway down the panel. I knew that I wanted a straight line and I didn't want to move my stamp on my misti once it was on. So instead, I moved my cardstock panel up along the misti as I changed inks. I was using distress inks, and sometimes they don't stamp smoothly, so I was really happy the misti kept everything lined up so I could stamp multiple times. 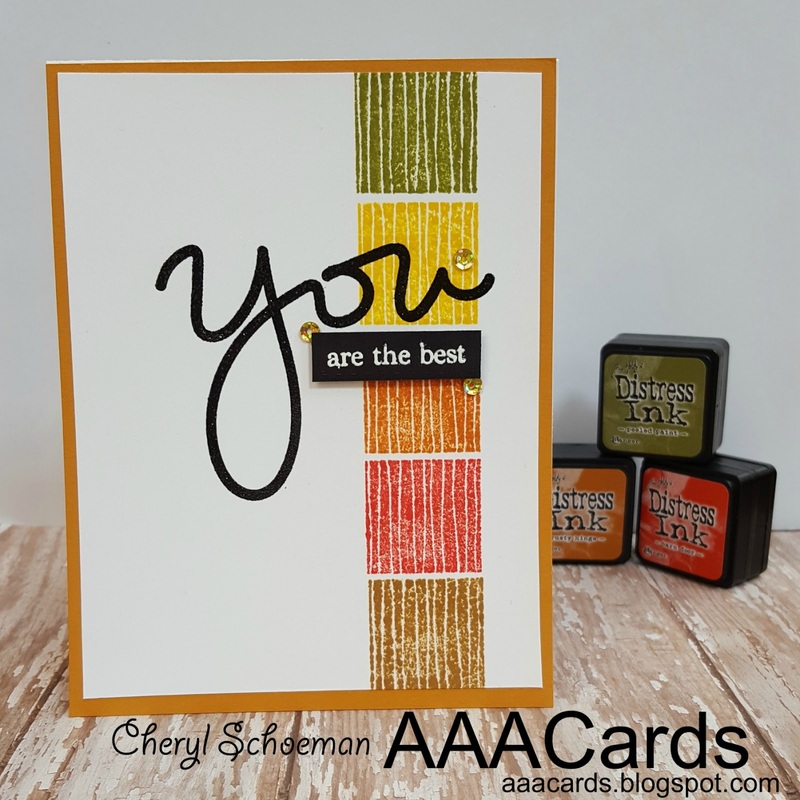 Once my stamping was done, I trimmed the panel down slightly and die cut the 'you' out of black cardstock. I was only using one layer of the die cut so I pressed it down in versamark ink and then used clear EP on it. It doesn't show in the picture but in real life it gives it a slight texture and shine. Then I stamped the rest of the sentiment in versamark ink on a strip of the same black cardstock and embossed it with white EP. I used foam tape behind the smaller sentiment and layered it on some orange-ish cardstock I had. A couple of sequins finished off my card.